The nation got a wakeup call recently when the American Society of Civil Engineers (ASCE) released its Report Card for America's infrastructure. Listed among the failing grades for roads, bridges and ports, was a grim evaluation of our energy infrastructure. Giving it a grade of D+, the Report Card detailed the need for investment throughout the nation’s electricity system, but focused primarily on the aging electric grid. 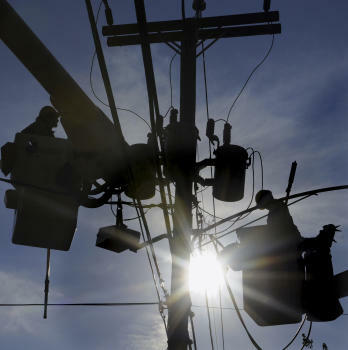 The nation’s power grid, which consists of a system of interconnected power plants, transmission and distribution facilities, some of which date back to the 1880s, is in dire need of repair. Anyone who has suffered from a power outage understands how the grid impacts our quality of life, but few people understand just how much it impacts our economy. What was once a stable supply of power is becoming more and more compromised as the nation relies on an increasingly aging grid. Significant power outages rose from 76 in 2007 to 307 in 2011. While weather-related events have been the main cause of major electrical outages, many others have been attributed to operations failures. There are also a growing number of reliability issues developing from the complex process of rotating in new energy sources and “retiring” older ones. According to another ASCE economic analysis, if investment in the system isn't increased by at least $1 billion a year, service interruptions between now and 2020 will cost the economy almost $200 billion. To put this in perspective, Hurricane Sandy delivered $30-$50 billion in economic losses. In addition to reliability issues, the rapid build-out of new electricity sources and the natural gas energy boom in the U.S. today will not be able to make the impact many have been predicting unless there is adequate infrastructure. The Report Card’s D+ grade of the energy sector was not really news to those in the industry, but affirms what we have known for years. Many of the nation’s energy assets are more than 50 years old, built before the Beatles had released their debut album and when a gallon of gas cost less than $1.00 – long before we fell in love with iPads, cell phones or the Internet. Our nation now relies on antiquated energy infrastructure and uses the system in ways it was never originally constructed to be used. Our electron guzzling economy demands updated infrastructure: There is not a business in the nation that doesn’t rely on stable power supplies day in and day out to keep their operations running. The good news is that private investment stands ready to modernize our grid now. Unlike many other types of infrastructure, transmission upgrades are paid for through private financing. Transmission operators like ITC (ITC) focus solely on making the most strategic, necessary investments in the electricity grid to improve reliability, provide access to competitive markets that reduce the cost of energy to customers. Just as power outages have wide-ranging negative impacts, investments in our grid can send positive ripples across our entire economy. The ASCE analysis found that closing the investment gap would prevent $656 billion in personal income losses, almost $500 billion in GDP losses, and save 529,000 jobs. While private investment can fund this progress, government has a role to play in moving us toward a truly modern grid. Policymakers must commit to a long-term, national energy policy that supports the advancement of economic growth, energy security and environmental stewardship. That policy must be nimble enough to incorporate all forms of energy produced in the most efficient way possible, and remove the red tape that has prevented the creation of an energy superhighway that can connect every domestic energy resource. Like our interstate highway system, our electric grid is a national asset that supports the free flow of commerce and keeps our economy humming. It is time for policymakers to make modernizing this vital piece of infrastructure a priority and allow private investors to raise the grid’s grade. Joseph L. Welch is chairman, president and CEO of ITC Holdings Corp, the nation’s largest independent electric transmission company. Based in Novi, Michigan, ITC invests in the electric transmission grid to improve reliability, expand access to markets, lower the overall cost of delivered energy and allow new generating resources to interconnect to its transmission systems.